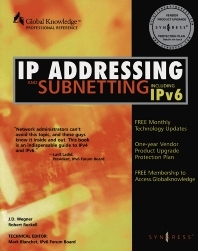 Internetworking Protocol (IP) addresses are the unique numeric identifiers required of every device connected to the Internet. They allow for the precise routing of data across very complex worldwide internetworks. The rules for their format and use are governed by the Internet Engineering Task Force (IETF) of the The Internet SOCiety (ISOC). In response to the exponential increase in demand for new IP addresses, the IETF has finalized its revision on IP addressing as IP Version 6, also know as IPng (ng = Next Generation). Key hardware vendors such as Cisco and major Internet Service Providers such as America Online have already announced plans to migrate to IP Version 6. IP address allocation within an organization requires a lot of long-term planning. This timely publication addresses the administrator and engineer's need to know how IP 6 impacts their enterprise networks. How Many Subnets Do You Need? How Many IP Addresses Are Needed in Each Subnet? Can I Pick My Own? How Does Static NAT Work? How Does Dynamic NAT Work? What Are the Performance Issues? Why Are Variable-Length Masks Necessary?. More Addresses or More Useful Addresses?